If you’re struggling with a dilemma in your business right now about which way to move forward, then maybe you need to change the question you’re asking yourself. Very often, the business owners I’m working with come to me with a specific challenge, such as a financial target they want to achieve, or to give them a better work / life balance. How do I improve my profit margins? How can I outsource some work? How can I get more of my to-do list completed each day? These type of ‘How to’ questions are all absolutely valid and can add a huge amount of value, but if you are finding yourself consistently looking to the ‘How to’s’, and still struggling to move past your challenges, then maybe it’s time to start asking some bigger questions. 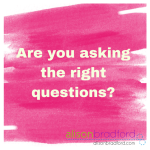 They are plenty of ‘how to’ guides out there, and I offer them myself, but before you can implement the ‘how to’s’ you need to know your answers to some bigger questions. Why am I running this business? What do i want my business to do for me / my family? How do I want my business to fit into the rest of my life? There are plenty of ‘bigger’ questions you could be asking! So, if you find yourself drawn to the ‘how to’s’ but still struggling to progress beyond your current challenges, then it’s time to start asking yourself some bigger questions. Not sure what questions to ask? I can ask you them! Book in a strategy call with me and let’s get you unstuck. You can check availability and book in my online diary here.